It was a particularly weird week for time capsules. Everybody's trying to figure out where those 19th century coins came from, a town in Australia is debating whether they should open a 1994 capsule with old photos of Keith Urban, and one Redditor is trying to bury some dogecoins. Seriously. Much capsule. Very time. Wow. Today's time capsulers often struggle with how to put digital goods in physical capsules. But this might be a new one: A Redditor in the UK supposedly wants to include dogecoins in his new capsule. 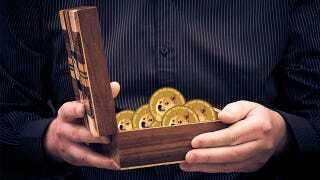 Reddit user iwillbeyourbodyguard posted on a dogecoin subreddit this week asking how one might bury 14 dogecoins in a time capsule. Apparently this person is assembling the capsule with his daughter and plans on burying it in a hole in the neighbor's yard. He looked into burying bitcoins, but he said that they were too expensive. "I'll print them off and seal them in a separate tin and one day someone will open the capsule and hopefully be rich like the guys who found the gold coins last week," the Redditor explained, referring to the extremely valuable coins found buried in California recently. A family in Needham, Massachusetts was surprised to find quite a treasure recently while remodeling their kitchen: two time capsules. "You hear about this sort of thing happening," Abigail Harmon told the Needham Times. "But you never believe it's going to happen to you." Based on the contents, one time capsule appears to be from the late 1930s, while the other is from 1984. Both include letters, newspaper clippings, and even candy wrappers from their respective eras.